Excerpts from studies of the earthquake and tsunami undertaken under contract with the National Science Foundation under the U S - Japan program for cooperative research in the Pacific and for the U.S. Navy, Office of Naval Research - published in the University of Hawaii Institute of Geophysics Reports, in Pacific Science, and in the Volume on Seismology and Geodesy on the Great Alaska Earthquake of 1964, by the National Academy of Sciences). The greatest earthquake of the 20th century in the northern hemisphere occurred in the Prince William Sound of Alaska on March 28, 1964. It was felt over a large area of Alaska and in parts of Western Yukon Territory and British Columbia, Canada. Earthquake - induced landslides triggered numerous local destructive tsunamis within the Prince William Sound. A Pacific-wide tsunami was generated by the earthquake in the Gulf of Alaska. The following is a brief summary of the geologic history and general geomorphology of the area affected by the great earthquake and of the source mechanism of the major tsunami that was generated in the Gulf of Alaska. A brief discussion is provided on the volume of crustal displacements, on the dimensions of the tsunami-generating area - as estimated by an inverse tsunami wave refraction method - and on the estimates of earthquake and tsunami energies. The near and far field effects of the Pacific-wide tsunami are briefly discussed. Additional links to further studies are provided. On March 28, 1964, (UTC date, March 27, local date) the largest earthquake of the 20th century in the northern hemisphere, occurred in the Prince William Sound and the Gulf of Alaska. Earthquake- induced landslides triggered numerous local destructive tsunamis within the Prince William Sound area. Large scale crustal movements in the Gulf of Alaska generated a Pacific-wide tsunami that devasted many towns along the Gulf of Alaska and caused serious damage at Alberni and Port Alberni, Canada, along the West Coast of the United States, in California (Crescent City mainly), and in the Hawaiian Islands. Epicenter - Lat. 61.04 N. - Long. 147.73 W., near the east shore of Unakwik Inlet in northern Prince William Sound, about 10 km east of the mouth of College Fiord, about 90 km west of Valdez, and about 120 km east of Anchorage. Magnitude - The Surface-wave magnitude was 8.4 on the Richter scale, which was greater than the 1906 San Francisco earthquake (8.3). A Moment Magnitude of 9.2 was later assigned to this event, which made it the second largest earthquake recorded in the 20th Century. The largest was the 9.5 earthquake in Chile in 1960. Duration of rupture - It took approximately 4 minutes (240 sec.) for the earthquake's rupture to propagate a distance of about 800 km. Aftershocks - In the first day of the main earthquake there were 11 aftershocks with magnitude greater than 6.0 on the Richter scale. The largest of these had a magnitude of 6.7. In the next three weeks there were 52 more aftershocks, 9 of which were large. Thousands more smaller aftershocks were recorded in the months following the main event. The aftershocks continued for more than a year. They extended in an area from about 15 km north of Valdez to about 55 km. south of Trinity Islands and were heavily concentrated on the northeast and the southwest of the uplifted region (USC&GS, 1964), The aftershock zone was about 250 km wide and extended about 800 km. - closely corresponding to the tsunami generating region. The earthquake ruptured the earth's crust from near Valdez to south of Kodiak Island in the Gulf of Alaska. The ground motions lasted for about four minutes.The strong motions triggered many landslides and avalanches which in turn generated many destructive local tsunamis within Prince William Sound. The earthquake was felt over an area of about 1,300,000 km2 extending from Alaska to parts of western Yukon Territory and British Columbia, Canada, and as far south as the State of Washington. Long period seismic waves traveled around the earth for several weeks. Basically the whole earth vibrated like a church bell. Vertical motions of up to 5 to 10 cm were reported from as far away as Texas and Florida. There were reports of water level fluctuations at distant wells and lakes. Major structural damage occurred in many of the major cities of Alaska. Damage was heavy in many towns, including Anchorage, Valdez, Whittier, Seward, Seldovia, Homer, Chitina, Moose Pass, Portage, Sterling, Wasilla, Glennallen, Hope, Kasilof, Kenai and Kodiak. However, the death toll from both the tsunami and the earthquake were extremely small considering the magnitude and extent of the area affected. The reason was Alaska's low population density and the fact that the earthquake occurred on a holiday (Good Friday). Also, most of the homes and buildings in Alaska were of light wood construction. The earthquake and the tsunamis were responsible for the total loss of 125 lives (tsunami 110, earthquake 15 in Alaska; 16 from tsunami in Oregon and California), and for about $311 million (1964 dollars) in property damage. Much of the damage and most of the lives lost were due to the effects of tsunami waves. Anchorage: At Anchorage, which was about 120 kilometers northwest of the epicenter, there was severe damage to property. About 30 blocks of homes and commercial buildings in the downtown area were severely damaged or destroyed. Among them were: the J.C. Penny Company building (which was damaged beyond repair), the Four Seasons apartment building, a new six-story structure (which collapsed). Many other multistory buildings were damaged heavily. The schools in the Anchorage were almost devastated. The Government Hill Grade School was almost a total loss. Anchorage High School and Denali Grade School were damaged severely. Landslides and ground subsidence were responsible for the heavy damage. Huge landslides occurred in the downtown business section, and at Government Hill area. The largest of the landslides occurred at Turnagain Heights where an area of about 130 acres was completely devastated. About 75 homes were destroyed. Water mains, gas, sewer, telephone, and electrical systems were disrupted throughout the area. Tsunamis in Prince William Sound - The shallow continental shelf and the islands bordering the southern side of Prince William Sound, as well as the pattern of crustal displacements, confined the waves generated in this area to the Sound itself; very little energy escaped this closed region. Most of the energy was expended in the narrow, deep fjords of the Sound, creating catastrophic waves and setting up resonating oscillations and surges that lasted for hours. 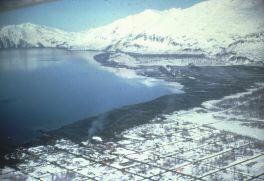 ( Aerial photo of Valdez, Alaska, showing extent of inundation). In certain places maximum inundation occurred five or six hours later, at high tide. At Valdez, for example, the third wave came in at 2300, March 27, and the fourth one at 0145, March 28 (Brown, 1964). This last wave took the form of a tidal bore and inundated the downtown section of Valdez, ruining almost all the merchandise in the stores. These waves could not have come from the generating area outside Prince William Sound because if this were so, it would have taken them only 34 minutes to reach Valdez. It is more likely, then, that the waves at Valdez arrived in resonance at high tide, from the immediate area of Port Valdez. Maximum positive crustal displacement in Prince William Sound occurred along the northwest coast of Montague Island and in the area offshore. These earth movements caused a gradient in hydrostatic level and the resulting short-period wave raced through Knight Island Passage within 10 minutes and on toward Chenega Island, inundating the village of Chenega to an elevation of 15.5 m and completely destroying it. This same wave continued north through Knight Island Passage and inundated Perry and Naked Islands, but to lesser heights (Berg et al,, in prep.). (Aerial view of Seward, Alaska showing extent of inundation and damage to oil storage tank ). Bathymetric surveys by the USC&GS (1964) in the area off Montague Island and at the north end of Latouche Island revealed a number of large submarine slides. It is possible therefore, that the combination of submarine slides and the tilting of the ocean floor due to uplift created the solitary wave reported at Chenega village and at Perry and Naked Islands. A second wave about 40 meters high (125 feet) was reported coming out of the Valdez Narrows and spreading across the Sound (Plafker and Mayo, 1965). The maximum tsunami wave height recorded was 67 meters at Valdez Inlet. This wave was caused by slumping of the glacial deltas in Port Valdez which had been shaken loose by the force of the earthquake . The effects of local tsunamis in the Prince William Sound area and of the Pacific wide tsunami generated in the Gulf of Alaska are further discussed separately (see links below). There were other far field effects caused by seiche action in rivers, lakes, bayous, and protected harbors and waterways along the Gulf Coast of Louisiana and Texas and minor damage was reported. Waves were was also recorded on tide gages in Cuba and Puerto Rico. These waves were caused by strong surface seismic waves traveling around the earth, rather by the tsunami generated in the Gulf of Alaska. The Aleutian Island Arc and the Aleutian Trench extend for 2,800 km from Kamchatka to south-central Alaska along remarkably smooth curves which are convex toward the south (Fig. 1). 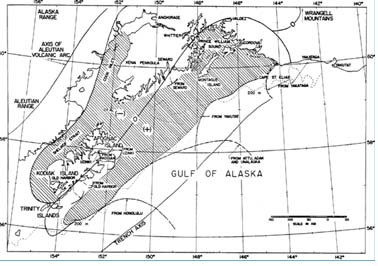 The Arc forms the Alaska Peninsula, and according to Wilson (1954), intersects north of Cook Inlet a second tectonic arc that extends northward from the vicinity of the Wrangell Mountains. However, Plafker (1965) regards this second segment as a continuation of the Aleutian Arc. Where the trench impinges on Alaska, it loses its identity, although an offshore range of seamounts suggests that it may have once extended around to the south, to parallel the continental slope as postulated by Menard and Dietz (l951). Concavity in the former shape of the trench on its eastern segment is also suggested by the sedimentary arc defined by Wilson (1954) - which embraces Kodiak Island and the Kenai Peninsula. As indicated by Wilson, such concavity is to be expected where two arcs meet at an acute angle, as is well exemplified where the Aleutian end Kuril-Kamchatha arcs intersect. It is also quite possible that large horizontal movements of crustal blocks have helped change the shape of the Aleutian Trench and Arc on their eastern segments. However no such evidence was found in a field study that followed the Good Friday earthquake (Berg et al., personal communication). The nature of termination of the eastern segment of the Aleutian Trench is obscured by thick sediments washed in from the continental shelf against which it abuts offshore from Cape Suckling. The sediments are of geosynclinal dimensions in the sedimentary arc on Kodiak Island (Menard and Dietz, 1951) and as shown by drilling on the Kenai Peninsula. Woollard et al. (1960) show that there is geophysical evidence for at least 7 km of sediments in Cook Inlet, a graben separating the primary arc from the offshore sedimentary arc. Sediment is about 2 km thick off Kodiak Island along the Aleutian Trench, thinning out to about 0.7 km south of Unimak Island in the deep water area, according to seismic measurements by Shor (1962). The March 28, 1964 earthquake and its aftershocks occurred along a low-angle thrust fault on the eastern segment of the subduction boundary of the Pacific and North American plates, delineated by the Aleutian Island Arc and the Aleutian Trench. The northwestward motion of the Pacific plate in this segment is estimated to be about 5 to 7 cm per year. This motion causes the crust of southern Alaska to be compressed and warped, with some areas along the coast being depressed while other areas inland are being uplifted. After periods of tens to hundreds of years, the compression which is accomodated elastically, is relieved by the sudden southeastward motion of portions of coastal Alaska.- thus restoring temporary equilibrium in the region. The end result of the great earthquake of March 28, 1964 was the sudden movement of the Pacific plate under the North American plate by about 9 meters on the average. The generating area of the March 28, 1964 tsunami corresponded to the region of vertical and lateral tectonic dislocations of the earthquake in the Gulf of Alaska. Based on surveys of accessible areas on land, it was established that the tectonic dislocations ranged over a distance of 800 km from the upper portion of Prince William Sound to southwest of the Trinity Islands (Van Dorn, 1964). However, the seaward limits of the tectonic displacements could not be determined. The present study was undertaken to define the seaward extent of the earthquake's tectonic displacements from indirect ocenographic analysis of the tsunami waves that it generated (using inverse wave refraction) and the characteristic wave patterns recorded at distant tide gauge stations. The tsunami refraction studies described here, strongly indicated that the tsunami-generating area was mainly in the belt of uplift and included a large segment of the continental shelf and slope. This vertical deformation affected an area of approximately 250,000 km2 (100,000 square miles) - most of it under water. Extent of Area Affected by Crustal Uplift and Subsidence - Extent of Tectonic Displacements. The zone between the known areas of tectonic uplift closely corresponded to a major low-angle thrust fault defined by crustal seismic measurements conducted by the Department of Terrestrial Magnetism of the Carnegie Institution of Washington (Woollard et al., 1960). In view of the shallowness of the earthquake (23 km), it was concluded that the crustal dislocations occurred alongside a zone of tilting or a surface rupture (Grantz et al., 1964). A survey of the area, however, failed to identify such a feature. The focal depth correspond though, to the base of the granitic layer defined by Woollard's analysis of the Carnegie Institute crustal measurements. Fig. 1 Generating area of the Alaska tsunami. Crosshatched area indicates (-) area of subsidence and (+) area of uplift. Heavy dashed lines indicate the backwards refracted tsunami wave fronts. Solid line marked by a zero is the axis of rotation (no elevation change) Other solid lines are titled as tectonic axes. The study of tsunami source mechanism required a closer examination of crustal displacements on land and extrapolation of estimated displacements on the continental shelf in the Gulf of Alaska. Also examined were the patterns of uplift and subsidence which had been slowly developing prior to the earthquake. When the earthquake struck, these patterns were suddenly reversed. Also, from the geologic evidence on land areas, it was established that the dislocations caused by the great earthquake followed a dipole pattern of positive and negative displacements on either side of a zero-line (line of no vertical change separating zones of uplift and subsidence). This zero line intersected the east coast of Kodiak Island and continued northeast to the western side of Prince William Sound. There, changing direction, it ran east along the upper part of the Sound. The zero line roughly paralleled the Aleutian Trench axis and it separated the Kodiak geosyncline from the shelf geanticline. As illustrated in the map, the areas north and west of this zero line of displacement underwent negative elevation changes (as a result of the earthquake), whereas the areas east and south underwent positive changes. Also, there were significant lateral movements. For example, Latouche Island moved about 18 meters to the southeast. The earthquake's vertical uplift ranged up to 15 meters. This maximum uplift on land was off the southwest end of Montague Island, where there was absolute vertical displacement of about 13 - 15 meters (but suspected to have been considerably more offshore). The major area of uplift trended northeast from southern Kodiak Island to Prince William Sound and trended east-west to the east of the Sound. Also, large positive displacements were observed as far south as Middleton Island and southwest to Sitkinak Island. Uplift occurred along the extreme southeastern coasts of Kodiak and Sitkalidak islands and part or all of Sitkinak Island. The estimated uplift of Sitkinak Island was from 0.35 to o.65 m and possibly as much as 1.5 m (according to Plafker, 1965). An extensive pattern of positive surface dislocations under the sea was suspected to lie east of the island of Kodiak and along the continental shelf bordering the Gulf of Alaska. In brief, the area of uplift was estimated to cover about 105,000 km2 (sq. Km) and extended from southern Kodiak Island northeast to Prince William Sound. It included the southern and eastern parts of Prince William Sound, the coastal area as far east as the Bering Glacier, the continental shelf and part of the continental slope to a depth contour of approximately 200 meters. The area that subsided included the northern and western parts of Prince William Sound, the western segment of the Chugach Mountains, portions of the lowlands north of them, most of the Kenai Peninsula and almost all of the Kodiak Island group. This area of subsidence is about 800 km long and 150 km wide. This zone of subsidence covered about 285,000 square kilometers. However Plafker (1965) estimated that the volume of crust that has been depressed below its pre-earthquake level was about 115 km3 (cubic km). An average of about bout 2.3 meters of subsidence relative to sea level occurred throughout this region. Geological investigations defined the land areas affected by the earthquake. To the east, the zone of deformation appeared to die out between the Bering Glacier and Cape Yakataga. The northwestern limit of tectonic changes extended at least to the west side of Shelikof Strait and Cook Inlet (Plafker, 1965). The north inland limit was known only along the highway connecting Valdez and Fairbanks; it appeared to extend in a northeasterly direction to the vicinity of the Wrangell Mountains, and quite possibly into the Alaska Range. and "d" is the changing depth of the ocean . Such a method of preparing refraction diagrams has shown good results, especially if carried out on large-scale charts with detailed bathymetry (Johnson, O'Brien, and Isaacs, 1948 ). In constructing the refraction diagrams for the Alaska tsunami, the marigrams of different tide gage stations around the Pacific were consulted and the total travel tine of the first wave at each station was determined. Then refraction diagrams were constructed toward the earthquake area from each tide gage station in lengths of time equal to the calculated travel time for that station. It was assumed that the last wave front in each refraction diagram would correspond to a point on the boundary of the generating ares, and if enough refracted wave fronts from different stations were plotted, an envelope defining the tsunami-generating area could be drawn. Wave fronts were refracted from Yakatat, Cape Yakataga, Seward, Uzinki, Kodiak, Old Harbor, Unalaska, Adak, Attu, and Honolulu. See diagram of wave fronts refracted towards the earthquake area from Attu Island (dashed lines), Adak Island (solid lines) and d Unalaska Island (dotted lines). The last front of each of the retracted waves is shown by a heavy dashed line in Figure 1. The seaward boundary of the generating area is near the 200-m depth contour which defines the edge of the continental shelf. Maximum displacements of the ocean floor occurred along the continental shelf, from an area southeast of Kodiak Island, to an area close to Cape St. Elias south of the island of Kayak (see Fig. 1). Geologic evidence, however, has shown positive land displacements as far north as Cape Suckling and as far east as the Bering Glacier. It is quite probable, therefore, that the tsunami-generating area extended farther to the northeast although waves generated in such shallow water would reach tide gauges much later and their origin would not be identifiable. Unfortunately this same wave retraction technique could not be used to define the northern and western boundaries of the main tsunami-generating area, because conditions in Prince William Sound and elsewhere along the coast of Alaska were further complicated by local tsunamis, oscillations, and surge. In addition, no tide gauge stations were operating in the area, and personal accounts were conflicting as to the arrival times of the different tsunami waves. The northward limit is assumed to be restricted by the land boundaries, and the western limit to extend to the west side of Shelikof Strait and Cook Inlet. In estimating the travel time of the tsunami waves, corrections were made for the delay at the island of Kodiak in the arrival of the ground motions and rupture from Prince William Sound. These corrections ranged from 1 minute to 6 minutes and were based on the fact that the Navy Weather Central on the island of Kodiak listed the time of the principal shock in Prince William Sound as 6 minutes later than the time listed by the USC&GS. This would imply that the wave front generated on the northeast side of the disturbance area had a 6-minute head-start on the wave front generated southeast of Kodiak Island. Based on the tsunami wave refraction study described here and the initial geologic measurements of vertical displacements, the total area affected by the Alaska earthquake of March, 28, 1964 was estimated to be approximately 215,000 km2 (square kilometers). However, this estimate was later revised to about 520,00 square kilometers, when more extensive surveys were completed.This is the largest area known to be associated with a single earthquake within historic times. The tsunami-generating area covers an area 700 km long by 150 km wide, a total of about out 105,000 km2 (sq. km). The volume of the uplifted crust along the continental shelf is about out 96 km3 (cubic km). The energy associated with the tsunami has been estimated by Van Dorn (1964) to be on the order of 2.3 x 10 (raised to the 21 power) ergs. This estimate is based on the source dimensions of an area 240 nautical miles by 100 nautical miles and an uplift of 1.8 m (6 feet) at the northeastern end of this area and zero at the southwestern end. This estimate however, is considered low because the generating area had dimensions that were much larger than those estimated by Van Dorn. According to Japanese seismologists ( Iida, 1958), the generating area of tsunami waves roughly corresponds to the distribution of the major aftershocks . This appears to indeed be the case in the Gulf of Alaska. The vast area of tectonic movements indicates that wave crests were generated along one or more line sources from the region of maximum uplift. Thus the shores of the Kenai Peninsula were struck within 23 minutes after the start of the earthquake, and those of Kodiak Island' within 34 minutes. ( Diagram of wave activity at Women's Bay, Kodiak Island - reconstructed from visual observations made at Marginal Pier, Nyman Peninsula ). This record has been corrected by Berg et al. for the 1.7 m ((5.6-foot)) submergence of the area as determined from tide gages of USC&GS (1964). Marigram of wave activity at Yakutat. 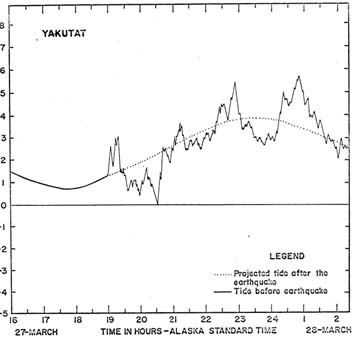 It is quite possible therefore that the first waves to arrive at Cape Yakataga had a different origin from that of the first waves to arrive at Yakatat. It could very well be that the Cape Yakataga waves traveled aver the shallow portion of the shelf, whereas the Yakatat waves came from the open ocean. An interesting aspect of these two records is that of the difference in amplitude and period of the first waves to arrive at these two sites- which also supports the hypothesis of different origin s.
h = height of crustal displacement . The waves generated in the Gulf of Alaska were of unusually long period on the order of an hour or more. Their energy radiation was preferentially directed towards the south east and this is why more damage was done to the North American coast than anywhere else east or south of the generating area. This preferential directivity of energy radiation can be attributed to the orientation of the tectonic displacements along the continental shelf of the Gulf of Alaska, and the long peiod ot the waves can be related to the long seiche period of the shallow shelf. The focal depth of the Alaska earthquake was about 20 kilometers . This was shallow enough to create tsunami waves even though the epicenter of the main shock was as much as 100 km inland from the coast. A number of shallower aftershocks over a large area ranging from Hinchinbrook Island to Southeast Kodiak indicate that crustal movements over a wide area were involved. Undoubtedly these shallow aftershocks created smaller waves that could not be separated out, in the tide gage records, from reflections of the initial tsunami. If the tsunami waves that hit the island of Kodiak were only the result of crustal movements, then the first wave could be expected to be the highest, at least within the generating area. At Uzinki, Kodiak City, Women's Bay and elsewhere on the island of Kodiak, however, the third and fourth waves were the highest. A theory of generation from a single pattern of crustal deformation is therefore not satisfactory here. Such factors as reflection from coastal boundaries, wave interaction, and resonance should be taken into consideration. Slumps or avalanches, similar to the one a that occurred in Prince William Sound, are usually localized; no large tsunamis can be produced that would travel across wide portions of the ocean. According to Wiegel (1954) not more than 2 per cent of the potential energy of a falling or sliding body is converted into wave energy. In Prince William Sound, however, slumping and sliding when added to tectonic movements created tsunami waves of very large energy, but their effect was catastrophic only locally; very little of the energy escaped the Sound. 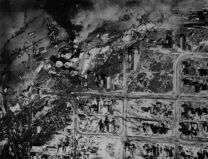 The Alaska earthquake of 27 March 1964 affected an area of approximately 215,000 km2 (sq. km), extending from the Wrangell Mountains at the northeast to the Trinity Islands to the southwest and from the west side of Shelikof Strait and Cook Inlet east to the vicinity of Bering Glacier. Geologic evidence has revealed a dipole pattern of positive and negative tectonic movements resulting from this earthquake. The area of subsidence covers approximately 110,000 km2 (sq. km) end the volume of crust that has been depressed below its pre-earthquake level is about 115 km3 (cubic km). The area of uplift covers about 105,000 km2 (sq. km) and includes the southern and eastern parts of Prince William Sound, the coastal area as far east as the Bering Glacier, and a great part of the continental shelf and slope bordering the Gulf of Alaska. The seaward limits of the area affected by the Alaska earthquake and the tsunami-generating area were determined by means of a series of wave refraction diagrams as shown in Figure 5, based on Snell's Law of Refraction. The tsunami-generating area covers140,000 km2 (sq. Km) and includes the whole of the region of uplift and part of the region of subsidence. It extends from the Trinity Islands to the Bering Glacier and includes Shelikof Strait, Cook Inlet and the continental shelf bordering the Gulf of Alaska to a depth of approximately 200 meters. The total volume of displaced material in the tsunami-generating area was estimated to be 120 km3 (cubic km), and the energy associated with the tsunami was calculated to be in the order 6x10(raised to the 21st power) ergs. 1. Two main tsunami-generating areas can be distinguished: one along the continental shelf bordering the Gulf of Alaska; the other, in Prince William Sound. 2. The main generating area in the Gulf of Alaska roughly corresponds to the geographic distribution of the major aftershocks. 3. 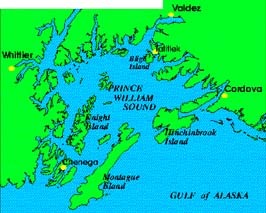 The energy of the tsunamis generated in Prince William Sound was expended inside the Sound:, not much energy escaped this closed region. 4. The long period of the waves generated in the Gulf of Alaska is related to the long seiche period of the shallow shelf. 5. The preferential radiation of energy towards the southeast is attributed to the orientation of the tectonic displacements along the continental shelf of the Gulf of Alaska. 6. The wares arriving at Cape Yakataga had their origin in the shallow coastal area near Bering Glacier, whereas the waves arriving at Yakatat traveled through the deeper waters. 7. In Prince William Sound two major tsunamis were distinguished: one had its origin near the west coast of Montague Island the other originated in the Port of Valdez. (b) waves generated indirectly from landslides, mud flows, and slumping of alluvial deposits. 9. In Prince William Sound both generation mechanisms were evident, while in the generating area along the Gulf of Alaska the generated tsunami was the direct result of tectonic movements. The initial work on was supported in part by the National Science Foundation under the U. S. -Japan program for cooperative research in the Pacific through grant No. GF-153, and in part by the Office of Naval Research through contract Nonr-3748(03). For this support I am grateful. I am particularly indebted to professors D. C. Cox, W. M. Adams, and G. P. Woollard for their advice and constructive criticism. Also, I would also like to acknowledge with appreciation the advice, comments. and suggestions given to me by Professors A. S. Furumoto, K. Kajiura, a. W.. Groves, H. G. Loomis, a. R. Miller and Robert Harvey. I also thank the members of the U. S..-Japan Cooperative Field Survey ( E. Berg, D. C. Cox,, A. S. Furumoto K. Kajiura, H. Kawasumi, arid E. Shima) for permission to use data from their initial report prior to publication. Iida, K., D.C. Cox, and Pararas--Carayannis, George. Preliminary Catalog of Tsunamis Occurring in the Pacific Ocean. Data Report No. 5. Honolulu: Hawaii Inst.Geophys.Aug. 1967. Pararas-Carayannis, George. Source Mechanism Study of the Alaska Earthquake and Tsunami of 27 March 1964, The Water Waves. Pacific Science. Vol. XXI, No. 3, July 1967. Pararas-Carayannis, George. Catalog of Tsunami in the Hawaiian Islands. World Data Center A- Tsunami U.S. Dept. of Commerce Environmental Science Service Administration Coast and Geodetic Survey, May 1969. Pararas-Carayannis, George, and D.C. Cox. A Catalog of Tsunamis in Alaska. World Data Center A- Tsunami Report, No. 2, 1969. Pararas-Carayannis, George, "Source Mechanism of the Water Waves Produced." Reprinted from Pacific Science, Vol. 21, No. 3, "A Study of the Source Mechanism of the Alaska Earthquake and Tsunami of March 27, 1964." Volume on Seismology and Geodesy on the Great Alaska Earthquake of 1964, National Academy of Sciences, Washington D.C., pp 249-258, 1972. Berg, E., D. C. Cox, A. S. Furumoto, K. Kajiura, H. Kawasumi, E. Shima. Field survey of the tsunami of 28 March 1964 in Alaska. Hawaii Inst. Geophysics report series. Brown, D. L. 1964. Tsunamic activity accompanying the Alaskan earthquake of 27 March 1964. U. S. Army Eng. Dist., Anchorage Alaska. 20 pp. Grantz, A. , G. Plafker, and R. Kachadoorian. 1964. Alaska's Good Friday earthquake March 27, 1964: A preliminary geologic evaluation. U. S. Geol. Survey Circ. 491. 35 pp. Iida, E. 1958. Magnitude and energy of earthquakes accompanied by tsunami and tsunami energy. J. Earth Sciences, Nagoya Univ., 6:101-112. Johnson, W. J.' P. 0. O'Brien, and D. J. Isaacs. 1948. Graphical construction of wave refraction diagrams. H. 0. Pub. No. 605. Menard, H. W. 1964. Marine Geology of the Pacific. McGraw-Hill Book Co., I Inc. , New York. P. 97-116. Menard H. W., and R. S., Dietz. 1951. Submarine geology of the Gulf of Alaska, Bull. Geol. Soc. Am., 62:239-253. Plafker, G. 1965. 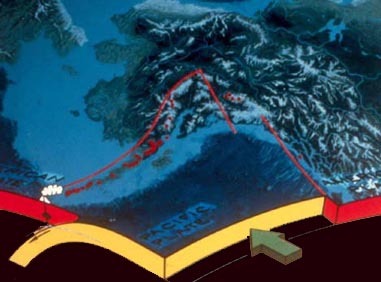 Tectonic deformation associated with the 1964 Alaska earthquake. Science 148:1675-1687. Plafker, G., and L. R. Mayo. 1965. Tectonic deformation, subaqueous elides and destructive waves associated with the Alaskan March 27, 1964 earthquake: an interim geologic evaluation. U. S. Geol. Surv. open file rept,. 19 pp. Shor, G. G. 3 Jr. 1962. Seismic refraction studies off the coast of Alaska: 1956-57. Bull. Geol.. Soc. Am., 52:37-57. U. S. Coast and Geodetic Survey. 1964. Preliminary Report, Prince William Sound , Alaskan Earthquakes; March-April 1964. 83 pp. .
Van Dorn, O. W. 1964. Source mechanism of the tsunami Of March 28, 1964 in Alaska. Chap. 10. In Proc. Ninth Conference on Coastal Engineering, Am. Soc. Civil Engross., pp. 166-190. Wiegel, R. L. 1954. Laboratory studies of gravity waves generated by the movement of a submerged body. Univ. California Inst. Eng. g. Res., Ser. 3 , Issue 362. Wilson, J., T. 1954. The development and structures of the crust. Chap. 4. In Gerard P. Kuiper (ed. ), The Solar System, v. 27 The Earth as a Planet. Univ. of Chicago Press. Woollard G. P. , N. A. Ostenso, E. Thiel, and W. E. Bonini..1960. Gravity anomalies, crustal structure and geology in Alaska, J. Geophys. Res., B. ., 65 :1021-1037. BERG, E., D.C. Cox, A. Furumoto, K. Kajiura, H. Kawasumi, and E. Shima, Field Survey of the Tsunami of 28 March 1964 in Alaska, Hawaii Inst. Geophys. Rpt. BROWN, D.L., 1964. Tsunami Activity Accompanying the Alaskan Earthquake of 27 March 1964, U.S. Army Engr. Dist., Alaska, ms., 20 pp. COULTER, H. W. and R. R. Migliaccio, 1966. Effects of the March 27, 1964 Earthquake at Valdez, Alaska, U.S. Geol. Survey Prof. Paper 542-C, 36 pp. IIDA, K., D.C. Cox, and Pararas--Carayannis, George, 1967. Preliminary Catalog of Tsunamis Occurring in the Pacific Ocean. Data Report No. 5. Honolulu: Hawaii Inst.Geophys.Aug. 1967. KACHADOORIAN, R., 1965. Effects of the Earthquake of March 27, 1964 at Whittler, Alaska, U.S. Geol Survey Prof. Paper 542-B, 21 pp. LEMKE, R.W., 1966. Effects of the Earthquake of March 27, 1964 at Seward, Alaska, U.S. Geol. Survey Prof. Paper 542-E, 43 pp. PARARAS-CARAYANNIS, G., 1967. Source Mechanism Study of the Alaska Earthquake and Tsunami of 27 March 1964, The Water Waves. Pacific Science. Vol. XXI, No. 3, July 1967. PARARAS-CARAYANNIS, G. 1972. "Source Mechanism of the Water Waves Produced." Pacific Science, Vol. 21, No. 3, "A Study of the Source Mechanism of the Alaska Earthquake and Tsunami of March 27, 1964." Volume on Seismology and Geodesy on the Great Alaska Earthquake of 1964, National Academy of Sciences, Washington D.C., pp 249-258, 1972. PLAEKER, G. and R. Kachadoorian, 1966. Geologic Effects of the March 1964 Earthquake and Associated Seismic Sea Wave on Kodiak and Nearby Islands, Alaska, U.S. Geol. Survey Prof. Paper 543-D, 46 pp. Stover Carl W. and Jerry L. Coffman, 1993, Seismicity of the United States, 1568-1989 (Revised), U.S. Geological Survey Professional Paper 1527, United States Government Printing Office, Washington: 1993. VAN DORN, W.G., 1964. Source Motion of the Tsunami of March 28, 1964 in Alaska, Proc. 9th Council on Coastal Engr., Trans. Am. Soc. Divil Engr..
WOOD, F., ed., 1966. The Prince William Sound, Alaska, Earthquake of 1964 and Aftershocks, v. 1, Operational Phases, U.S. Coast and Geodetic Survey, No. 10-3, 263 pp.